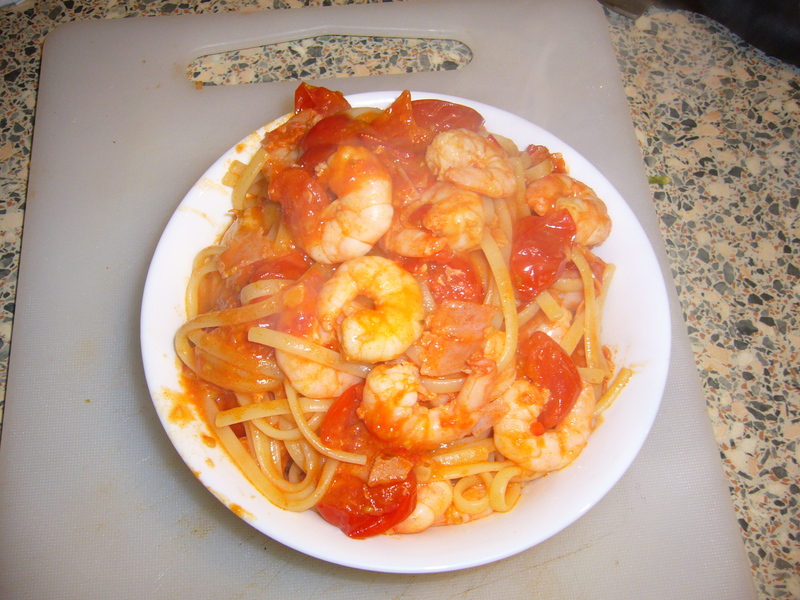 Another quick solo supper, chilli prawn linguini and done in the time it takes to cook the pasta. Put on as much pasta as you feel like and whilst it is cooking, fry a finely chopped clove of garlic and a finely chopped red chilli ( more or less if you like) when these have softened add some halved cherry tomatoes ( as many as you like depending on how hungry you feel, cook until the tomatoes release some of their juice and then a little of the pasta water. I picked this trick up off Nigella and it seems to work, the starch in the pasta water should help the sauce thicken a little to coat the pasta nicely. Drain the pasta and add the prawns (I used un cooked) to the sauce and cook until they turn pink. Add the pasta to the sauce and eat.